So, I wanted to be complete in my list of craft projects that I have started but haven’t completed. Keep me honest, so to speak. 14. 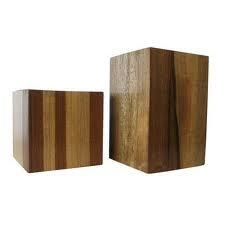 Block of wood: I actually seen this in the waiting room of my doctor’s office. It was much larger than the block I am working on, his was about 24″ square but about 36″ tall. It was absolutely gorgeous, finished with a natural stain that highlighted the grain. I hunted the surrounding towns and found a nice chunk of oak (still had some leaves attached) and had a friend with a chainsaw rough cut it down to about a one foot cube. Still needs some clean up, I think I need to invest in a planer to get it down and then some serious sanding. Then to finish with a clear stain. There is some real physical labor ahead of me in this project. 15. This I actually saw on Etsy.com (check it out if you’re not a crafty person and just want to get crafts already complete). There are some really seriously talented people on this website. Be prepared to spend some serious time on this site, you will see lots and lots of wonderfully constructed and imagined projects you will ever see in one place. I have thought about selling quilts on this site, except that at my last count, there was at least 18,000 quilts for sale on the site already. So, I thought this false front box would be awesome in the Kid’s room, a place to stash his cool stuff. And it looked relatively easy to do. Wasn’t the first time I was wrong, won’t be the last. 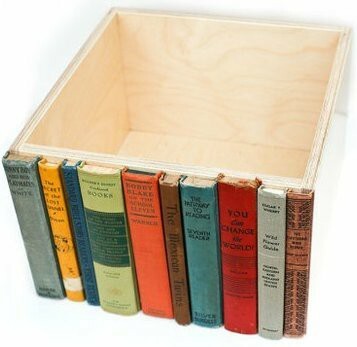 I have the box constructed and found the 8 books for the front. The trick is figuring out how to cut the books down without destroying them and then attaching them to the front. I figure this one is about 50% complete. 16. 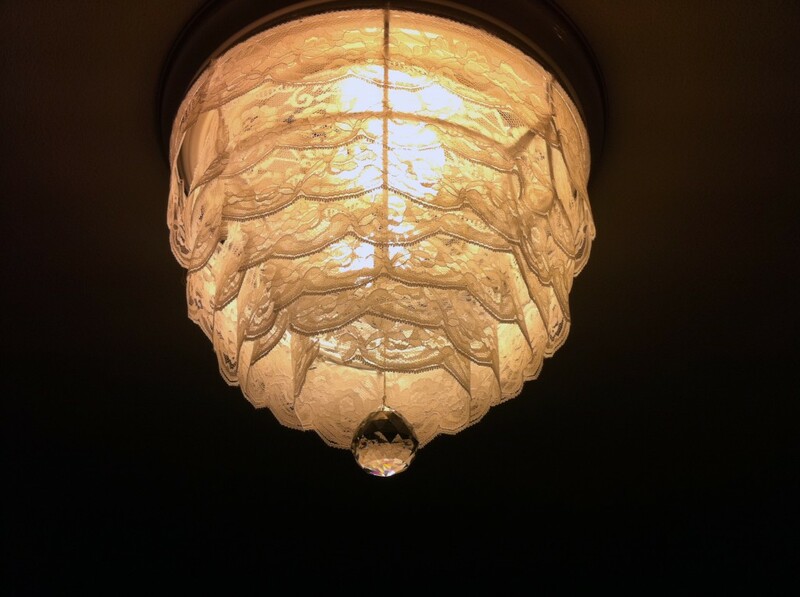 Doily Chandelier: My maternal grandmother Bertha used to crochet and loved to make doilies. Had them everywhere in her house – back of chairs, on the dining room table, in the bathroom. I inherited some when their estate was distributed. I love them. I have been collecting a fair amount as I have been going to estate sales and I thought I would use them in a couple of projects. One of them is for a chandelier for my guest bedroom. Something like this one. I have purchased all the components, now it is just a matter of putting them altogether and getting in hung. About 25% complete. 17. 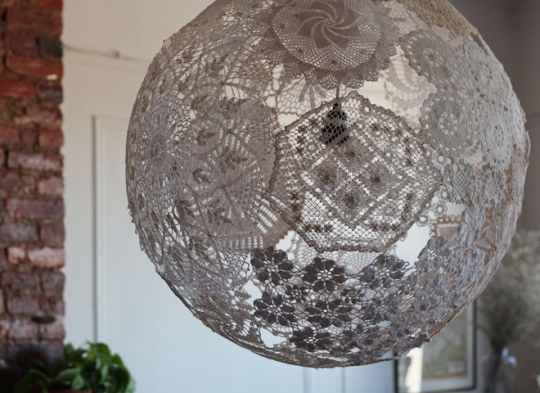 Doily Lamp Shade: This is my other doily project. 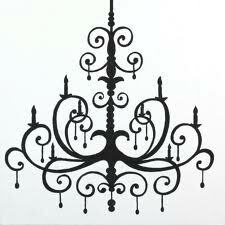 This would also be in the guest bedroom, on a lamp on a bedside table, would tie the lighting altogether. This is pretty easy as well, all that stands in the way is time. Always about time. This one is barely started, only about 10% complete. 18. Brass Chandelier: This piece is actually a conglomeration of two pieces of brass pieces, one a candlelabra and two wall sconces. This is going to take some real work, maybe even some welding to get this where I want. This will be a light fixture for my future master bedroom make-over. It will be in a dark brown metallic color with touches of dark turquoise. Still figuring out how to wire it for lights. 19. 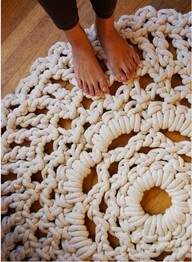 Crochet Rug: This is a matter of finding someone who will make this for me. I have made all the t-shirt yarn already. I think I have enough, more than enough. I don’t know how to crochet, but I tried to learn how to knit and figured out that knitting was just not in the cards for me. I am sure it is the same with crocheting. I am even willing to pay someone to do this for me. But when I saw this, I knew I had to have it for my master bathroom. 20. Colored Pencil Clock: A couple of clocks in my house have recently stopped working. Yes, it would be easy to just go out and buy replacements, but what is the fun in that? 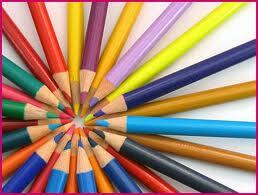 So, I saw somewhere a clock that was made from colored pencils, much like this design but with a clock as a center. Again, I have all the supplies, just haven’t really started. 21. 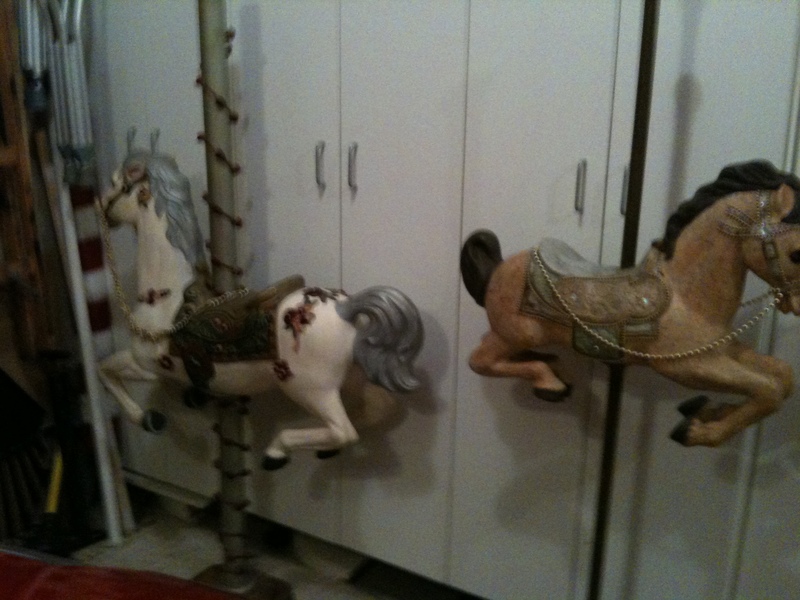 Carousel Horses: Last but not least, two carousel horses. I picked these up from a wonderful lady after seeing them on freecycle, free of charge. The larger of the two is destined to become a quilted horse, that is, she will be hand painted as if she were wearing a quilt. I have done this to a number of items already: a fish, a piano, a little chest of drawers, a teddy bear, big woodend letters that spell QUILT that hang in my sewing room. I think this is the most ambitious to date. Thus far, she has been stripped of her elaborate costume and primed white. I found a new based and a top finial. This will really take a lot of work. She sits in front of the fireplace and television, front and center, constantly reminding me that it requires work. It also allows me to imagine the different quilt patterns that I might use, and what color to complete her saddle and mane and tail. Project completion, about 20%. So, that I think is the complete list. Now that I have it right there in front of me it is a bit daunting to think about the amount of work that is waiting. But I am serious about completing as many as possible before beginning any new ones. I can do it when I set my mind to it. I promise to post photos as I complete them here. Hope you are enjoying your crafting as well.